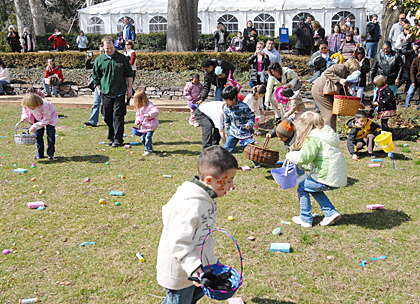 THEY’RE OFF AND ROLLING: The hunt’s on at the annual Easter egg hunt on the lawn at Drumthwacket. After setting Saturday’s event in motion, Gov. Corzine took part in a round-table discussion in the governor’s mansion with a group of taxpayers (including some state workers) who earned their places at the table by submitting suggestions for spending cuts to a state Web site. Borough Hall delivered its strongest rebuke in years to the state’s affordable housing regulations last Tuesday, saying for the first time since new regulations were released in December 2007 that the municipality could opt out of the state plan altogether. Just over a week after a contingent of residents descended on Township Hall to express concerns over a proposal to place a cellular radio tower on municipally-owned land in the northwestern portion of Princeton Township, municipal officials said Monday that the town would now seek an alternate solution for a known dead spot in police radio functions there. Andrew Koontz, the two-term Princeton Borough Councilman, has ended his bid for a spot on the Mercer County governing body, falling short Saturday in an attempt to receive an endorsement by the Mercer County Democratic Committee. In response to the Coalition for Peace Action’s call for a moratorium on the war to mark the fifth anniversary of the invasion of Iraq on Wednesday, March 19, Princeton High School students plan to walk out of school during the seventh period. You might have noticed what look like four glorified mailboxes downtown in recent days. No, you don’t want to put your bills in there, but you can toss any detritus that might otherwise have been overflowing from an everyday trash receptacle. People in the 1700s believed in “vapors”; in the 1800s poor hygiene was recognized as a source of disease. The late 1800s saw the germ theory take hold, and mass immunizations followed the Federal government interventions that characterized public health in the mid-1900s. What now? According to Dr. Joan Beckwith in a recent “Science on Saturday” talk at the Princeton Plasma Physics Laboratory, the face of public health in the 21st century is population-based healthcare, a system that focuses on promoting health and preventing disease before it happens. Their backs hadnt been to the wall all season but the players on the Princeton University mens hockey team were primed for the challenge. Coming into its game last Saturday with visiting Hofstra, the Princeton University mens lacrosse team put a major emphasis getting off to a good start. For Noah Savage, a highlight of his career on the Princeton University mens basketball team came before a game at Penn two years ago when his ears were ringing with the catcalls of the home fans.